by Edie Pijpers and Paul Willis, publishing – in progress! Breaking with my own tradition, I’m reviewing a series of children’s books, before they are even available. You might ask why. The answer is that after reading the first three, they are so beautiful and worthy of publication, that I wanted to let readers of Litkidz know about them right away. There are a total of seven books coming, aimed towards young children, and most useful as read-alouds by parents. They cover all aspects of mindfulness, in a very child-friendly and creative way. The irresistible part is that the illustrations are exquisite. My favorite so far is My Body, My Home. It was inspiring to see how the artists selected animals to highlight each part of the body, as the children’s book leads us through acknowledging and thanking each part of our body, from head to toe. It’s so helpful to have an accessible way to bring the mindfulness practice to even very young children, without seeming pedantic or distant. Each children’s book will explore a different aspect. While they are written to be read by early readers, I recommend that parents read them with their children, and initiate warm conversation. 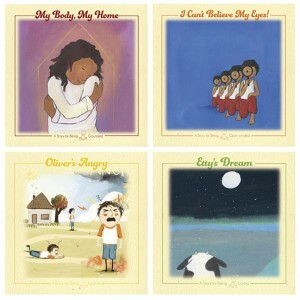 To have your own copy of these unique children’s books, there is a Kickstarter campaign, where the books are offered as a thank you for your support. I hope you can take advantage of this and help bring the books to life.